High-speed internet service provider BSNL has announced the extensional offer for Broadband new customers across India under Broadband services. 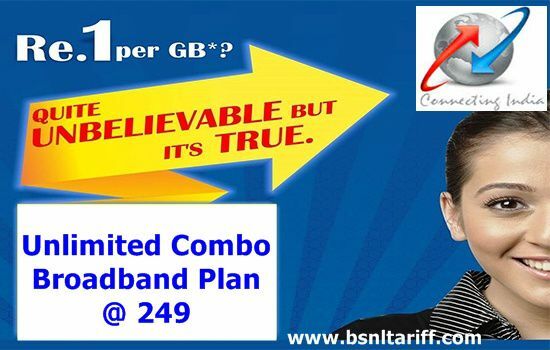 State run Telecom Company Bharat Sanchar Nigam Limited (BSNL) extended promotional Unlimited Combo Broadband plan ‘Experience Unlimited BB 249’ till end of this year up December, 31st 2016. As per latest information, BSNL competent authority based on good feedback and demand from various units and customers has decided to extend the promotional Unlimited Combo Broadband plan ‘Experience BB 249’ till 31st December, 2016 in all telecom circles (except Jammu and Kashmir and Andaman & Nicobar Telecom circles). 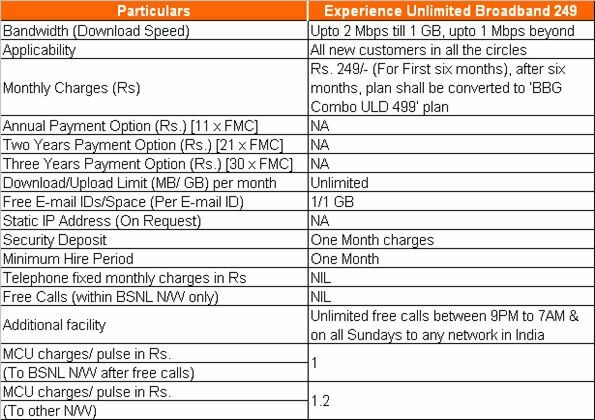 In competition with BSNL rival operator Reliance Jio BSNL launched this combo plan which is offering @ Rs.1 per GB exclusive for new broadband connection users. To gain maximum number of connections under Broadband plan services and to increase revenue BSNL dared to introduce this lowest rate monthly rental Combo plan for Broadband users in all Telecom circles. The above promotional offer will be available in all Telecom circles upto 31st December, 2016. However, this offer is not applicable to customers in Jammu and Kashmir and Andaman & Nicobar Circles.